The invitations are mailed, the donations are coming in, all we need is you! Misplaced your invitation? Or did it get lost in the mail? Let us know if you are planning to attend by e-mailing Betsey. 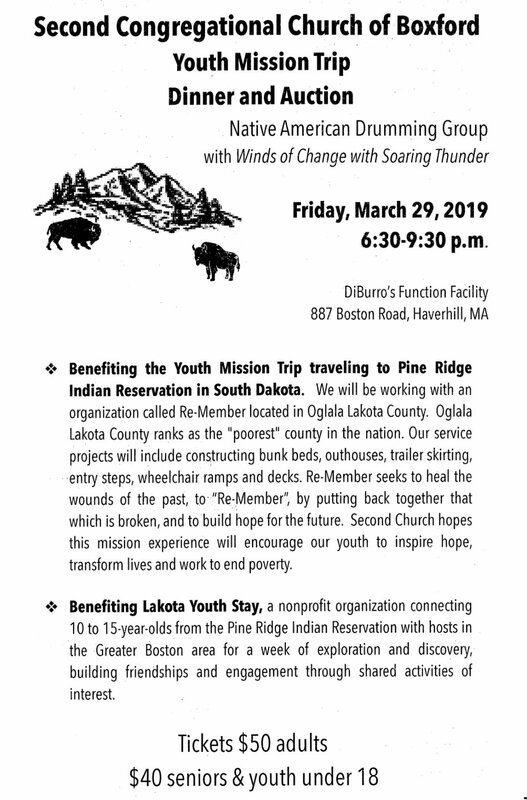 Join us in supporting two great ministries: the Youth Mission Trip to Pine Ridge Indian Reservation in South Dakota and Lakota Youth Stay which connects youth from the Pine Ridge Indian Reservation with host families right here in Massachusetts for a week of exploration and discovery. Please consider inviting friends to join you for a great evening with Native American drumming, delicious food and great items to bid on. What items you ask? How about great Celtics tickets Monday, April 1st? Or a hand-made quilt? Or dessert or cookie of the month? Manual Labor? Need your yard raked? That is just a sampling of what is being offered. Do you have an item you would like to donate to the auction? Please either drop it off at the Park House or email Betsey Guest-Natale.